The Department of Applied Chemistry offers academic programs leading to the degrees of bachelor of engineering, master of engineering, and doctor of engineering. Our research covers a wide range of areas in the following fields: inorganic chemistry, polymer chemistry, catalysis chemistry, applied biochemistry, chemical engineering, synthetic organic chemistry, and applied physical chemistry. Original research is an essential component of our academic programs. The Department of Applied Chemistry’s undergraduate program is designed to provide education that gives students a fundamental knowledge of chemistry. The undergraduate program consists of classes and laboratory courses offered by the Department and those available to all the students of the School of Advanced Science and Engineering. Our classes and experimentations include the followings. The goal of our undergraduate program is to teach the knowledge of chemistry and chemical experimentation required by active members of the chemistry community. Thus, the bachelor of engineering degree opens a gateway to graduate study as well as to many professions related to chemical processing, environmental science, teaching, biotechnology, and nanotechnology. 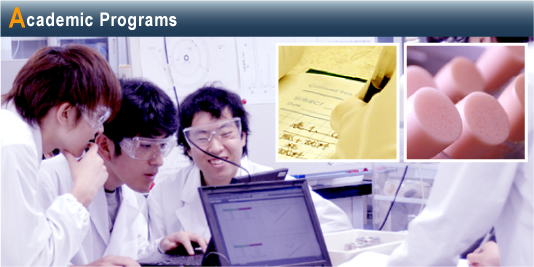 The Department of Applied Chemistry’s graduate program offers doctor of engineering and master of engineering degrees. The doctor of engineering degree program is designed to train future leaders in chemistry research in academia and the chemical industry. Research toward the doctor of engineering degree is undertaken under the supervision of a member of the faculty. The research is centered in the fields of inorganic chemistry, polymer chemistry, catalysis chemistry, applied biochemistry, chemical engineering, synthetic organic chemistry, and applied physical chemistry, but the actual research capabilities involved may be interdisciplinary. The goal of the master of engineering degree program is to produce chemists with superior research capabilities. Their research under the supervision of a member of the faculty gives students a general knowledge of the various approaches and some specialized skills in chemistry research. Participation in classes and exercises is also required. Our Global Center of Excellence (Global COE) program, “Practical Chemical Wisdom,” is one of the 13 selected Global COE programs in the field of chemistry and materials science in Japan. We cooperate closely with many research consortia, including our own organizations, for the establishment of “Practical Chemical Wisdom” with a view to meeting society’s expectations. Based on the concepts of “wisdom for research,” “intellectual development through education,” and “practical utilization of academic knowledge,” which are the goals of our university, this center operates as an educational and research organization of the highest caliber, whose activities include cooperation with institutions overseas.